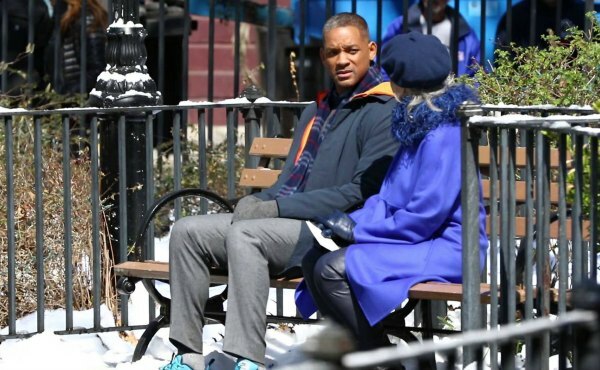 Drama directed by David Frankel which centers on New York advertising executive, Howard Inlet (Will Smith), who after experiencing a deep personal tragedy retreats from life entirely and slips into a severe depression. As a form of therapy, Howard begins writing letters to Time, Love and Death. His friends Whit Yardsham (Edward Norton), Claire Wilson (Kate Winslet), Simon Scott (Michael Pena) and Madeleine (Naomie Harris), grow concerned and devise a drastic plan to force him to confront his grief in a surprising and profoundly human way. Then the seemingly impossible happens: Love (Kiera Knightley), Time (Jacob Latimore), and Death (Helen Mirren) show up to meet Howard. Guided by these polar opposite forces, Howard learns to live again and begins to put his life back together. Howard: Love. Time. Death. Now these three abstractions connect every single human being on Earth. Everything that we covet, everything that we fear not having, everything that we ultimately end up buying is because at the end of the day we long for love, we wish we had more time, and we fear death. Madeline: Was it the holidays? Howard: No, it wasn’t that. Madeline: Then why did you decide to come in tonight? Howard: Um, I’m trying to fix my mind. Madeline: Did you lose a child, Howard? Whit: I tried to talk to him, I tried to reach him and he’s not there. I miss him. Sally Price: This might be the strangest thing I have ever come across. He writes letters? Sally Price: Howard doesn’t write letters to people, he writes to things. Time, love, death. Howard: You’re going to think I’m crazy, but I’m having conversations. Death came first, she met me in the dog park. Madeline: So death is a her. Howard: It turns out death is an elderly white woman. Brigitte: Who did you write the letter to? Howard: I wrote the letter to death. Brigitte: Nice to meet you. I’m charmed, I’m sure. Raffi: [to Howard] Remember me? I’m time. You wrote me because you need me. I’m a gift, and you’re wasting it! Raffi: Ask her, go ahead. Ask her if she can see me. Howard: He was sitting right here. Madeline: And he just appeared, right? Amy: [to Howard] I’m love. I’m the fabric of life. Amy: I am love. Don’t try and live without me, Howard. Amy: Love is the reason for everything. Howard: I felt you everyday when she laughed and you broke my heart! Amy: I was there in her laugh, but I’m also here now in your pain. Amy: [to Howard] We don’t get to choose who we love or who loves us back. And that means you’re powerless to me as long as you’re alive, because I’m the fabric of life. I’m within you. I’m within everything. Howard, if you can accept that, then maybe, I don’t know, but maybe you get to live again. Amy: [to Howard] I’m the reason for everything. If you can accept that then maybe you get to live again. Brigitte: He’s reaching out to the cosmos for answers. Raffi: There’s so much more at stake here than you even understand. Madeline: [to Howard] Something’s starting to happen to you. Claire: [to Howard] I don’t know what to do to bring you back. Whit: [to Howard] What if love, death and time are trying to help you? Madeline: [to Howard] You’ve been given a gift, this profound connection to everything. Just look for it, and I promise you it’s there, the collateral beauty. Madeline: [to Howard] You need to talk to them, Howard. Challenge them, just engage. Madeline: [to Howard] Just be sure to notice the collateral beauty. It’s the profound connection to everything. Whit: If he accepts that, maybe he can find his life again. Howard: [to death] You’re not here to take me, are you? Brigitte: No, Howard. I’m here to ride the F train with you.